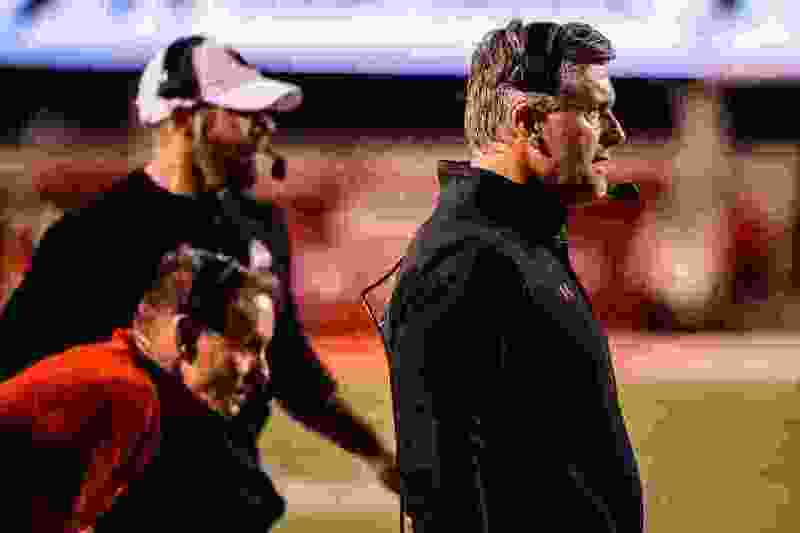 Red All Over: No matter how this Utah football season ends, Kyle Whittingham has succeeded in saving it. Utes' recovery from an 0-2 start in Pac-12 play gives them a great shot at a Pac-12 South title. (Trent Nelson | The Salt Lake Tribune) Kyle Whittingham as the Utah Utes host the USC Trojans, NCAA football at Rice-Eccles Stadium in Salt Lake City, Saturday Oct. 20, 2018. The signature season of Kyle Whittingham’s head coaching tenure didn’t require any salvaging, as Utah went 13-0 in 2008. Yet a case could be made that Whittingham has done his best work in years when his football team recovered after struggling in the first half of the season, and 2018 is shaping up as another one of those examples. The media get three weekly snapshots of Whittingham — in his postgame news conference, his formal session Monday and a less formal briefing after Tuesday’s practice. Judging his level of satisfaction is always tricky, but his demeanor Tuesday suggested he’s happier with this team than any he has coached in a long time. That makes sense. The Utes produced the program’s most dominant October performance since 2004, responding admirably after an 0-2 start in Pac-12 play. The obvious question becomes whether they can finish a drive to their first Pac-12 South title. I would say this: The Utes may lose a game in November, possibly Saturday at Arizona State, but it wouldn’t stem from a flat performance by Utah. There’s something different about this team, and an opponent will have to outplay the Utes to beat them. • Welcome to basketball season. The Ute women’s team showed a fast-paced, entertaining style in a 118-80 exhibition win over Westminster College on Wednesday, and the Ute men’s team will stage its only exhibition contest Thursday (6 p.m., Pac-12 Networks) vs. College of Idaho at the Huntsman Center. The Runnin' Utes are expected to live up to their basketball-specific nickname, with a deep, athletic roster in coach Larry Krystkowiak’s eighth season. • The Ute women’s soccer team has produced a solid regular season that will end Friday at Colorado. Utah (8-8-2, 5-4-1 Pac-12) is tied for fifth place in the conference, one point behind fourth-place Colorado. The Utes, coming off a 0-0 tie with conference co-leader USC, can make an NCAA Tournament case for themselves in Boulder. • Utah’s women’s volleyball team completed a season sweep of a good Washington team last weekend. The Utes (13-10, 5-7) are tied with Washington for eighth place, but are only one game out of fifth place. Conceding a loss Sunday at Stanford, with the Cardinal unbeaten in conference play, Utah needs to avenge a September defeat by beating California on Friday.